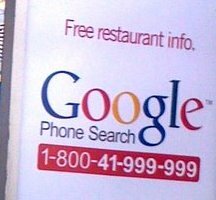 Google has recently launched Google Phone Search , a service that will help you search Google on the go. All you have to do is to pick up your phone and dial 1-800-41-999-999 to get access to local business information, movie times and real time flight statuses and so on. All this comes without any charge. Simply dial 1-800-41-999-999 (toll free) from any phone. The service is currently made available in Hyderabad, India in English, Hindi and Telugu languages. Sasidhar from Google shares pictures straight from Hyderabad. This seems a wonderful service. I think when you speak of innovation and creativity, Google does it in the best possible way. And good thing is almost every service that Google provides comes free of charge.